Creamy raw broccoli slaw is here, and I’m never letting it go. This healthy, vegetable-forward dish is packed with so much flavour from the creamy dressing, salty feta, and lots of sweet raisins — you will be shocked that it’s actually good for you! 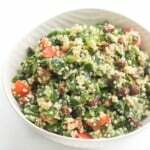 Serve this at your next BBQ as an alternative to a leafy green salad, or even for a lighter dinner next to a piece of grilled chicken or fish. Either way, this broccoli slaw will easily become your new favourite way to get in your daily dose of veggies. 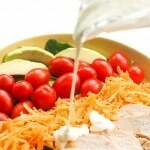 This recipe can be tweaked and altered as much as your heart desires!! Don’t have raisins? Add in a different dried fruit. Out of pine nuts? Toasted walnuts or slivered almonds would be great! Have goat cheese that needs to be used up? Swap it in. 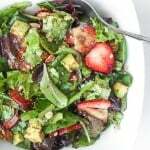 This salad is infinitely adaptable to whatever is in your fridge. Just leave the dressing as is because it’s so good. This is ready to eat after sitting tossed with the dressing for 30 minutes, but if you’ve got the time, definitely make this the day before; it gets better the longer it sits! Don’t be surprised when this slaw disappears quickly, it’s a total crowd pleaser. Creamy raw broccoli slaw is a healthy, vegetable-forward dish that is packed with so much flavour from the homemade creamy dressing, salty feta, and lots of sweet raisins — you will be shocked that it’s actually good for you! Cut the bottoms off the heads of broccoli so you’re left with small sized florets. Trim the bottoms so they’re not longer than 1-inch, then roughly chop and place in a large bowl. Combine broccoli with cabbage, feta, raisins, pine nuts, and scallions. In a separate bowl, combine mayo, dijon, white wine vinegar, lemon juice, shallot, salt and pepper, then stir to combine. Slowly drizzle in olive oil and whisk until all ingredients are incorporated (Add additional 1-2 tablespoons of olive oil if you like a thinner sauce). Toss all ingredients together, then let sit for 30 minutes, or up to overnight. 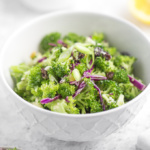 I absolutely love broccoli slaw and your recipe is perfect! 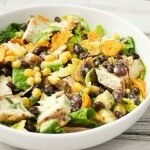 Love that you added in purple cabbage and pine nuts for the crunch and you dressing is light and tasty! I love broccoli! And I can never resist a good broccoli salad/slaw. I can’t wait to try out this recipe this summer at our next grill out! This has so many great flavors! I bet this recipe would be a big hit at any end of summer party. I imagine it would pair well with so many main dishes! This looks incredible and I bet it would be delish on top of pulled pork or brisket sliders! Of course, this is perfect for a graduation party I have next week, too! I love broccoli salad! This recipe sounds so good with the pine nuts and feta cheese. Some of my favorite flavor combos. Sounds delish! This looks absolutely amazing! So healthy and crazy versatile! I love it! I could pair this with so many things! I just love a good slaw recipe!